MQLs – play your cards right to convert them to sales. MQL (Marketing Qualified Lead) is a relatively well-known term in B2B Marketing circles but there is little real world advice on what they are or how to apply the idea in your business. In this post we’ll look at practical approaches to identify and act on your MQLs in a way that will grow your business long term. B2B Marketing has changed drastically in the last few years. High-pressure sales tactics don’t work as well as they used to, if anything, they now deter buyers rather than encourage them to invest in a product. To convert prospects into purchasers you need to provide them with the right information at the right time to make the decision to buy. This is called the buyer’s journey. Customer survey questions come in many shapes and sizes and it can be confusing as to which you should use when. 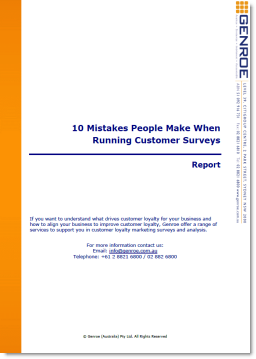 But help is at hand: there are only three types of customer survey question you will ever need. In this post we’ll examine each question type, how it should be used and provide examples. Focusing on increasing your survey response rate is important but I’m often asked: “what is a minimum acceptable survey response rate for a customer feedback survey: 1%, 15%, 50%?”. This question also comes in the form: what is the statistically valid response rate? …if I have two NPS of two different cinemas in January. Cinema 1: Spectators: 18509. Survey responses: 17. Responses percent: 0,1%. NPS: 76. Cinema 2: Spectators: 44190. Survey responses: 200. Responses percent: 0,5%. NPS: 43. My first question is: Can I do a valid comparison between the two cinemas? These are good questions but unfortunately the answer is not a single response rate but a range depending on what you are trying to determine. In this post we’ll discover that what is important is not so much the response rate, but but the total number of responses. Then we’ll use that information to calculate the acceptable response rate for your survey. It’s been a busy six months. You’ve rolled out a best practice transactional customer feedback process using Net Promoter Score® as your KPI of choice. The whole thing is going great with customer feedback comments flooding in. You’re driving tactical service recovery processes and starting to look at strategic customer experience changes.